I prefer this version of sports luxe. Halston and varsity are such a match made in heaven! Whoa, that is one awesome sporty chic look! You look amazing! Love that you wore that cool jacket with that elegant dress. I do like the idea of pairing sports with luxe! Halston IS the king of draping indeed.. beautiful dress! Nothing looks odd on you, gorgeous!! 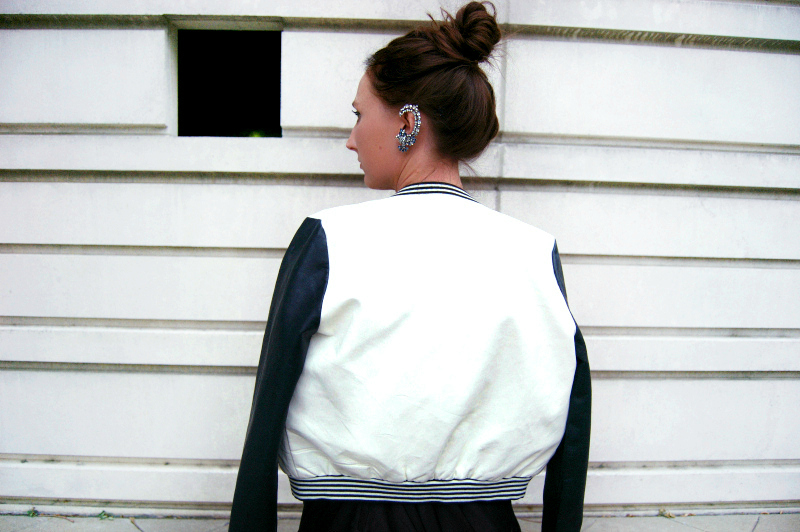 i pretty much love a baseball jacket paired with anything right now, especially a little draped number, LOVE this! Your dress is soooo fabulous! I’m obsessed with that first pic! IT looks like it belongs in a mag! Your styling is off the charts awesome! I love that varsity jacket!!! just the perfect shape and cut of the tulip dress… a bit of skin for just the right sense of sexyness. love it 🙂 and the whole outift is – a bingo!